The pinhole camera is a basic camera without a lens, which is a small, light-tight can or box with a black interior and a tiny hole in the center of one end. It is a nearly forgotten unique art form.Light passes through this hole, and produces an image on the film or emulsion inside the box providing a dark medium. The simple principle on which pinhole photography is based is estimated to have been known from about the 5th century B.C. The Chinese philosopher MoTi had written as a result of his experimental observations that the light entering through a small hole which opens out to a dark medium produces an upside-down reflection of any object outside this medium. Aristo in the 4th century B. C., Ibn Al-Haytam, who discovered the principle of the linear expansion of rays in the 10th century, Leonardo da Vinci and Paolo Toscanelli in the 15th century, Gemma Frisius in the 16th century, and Sir David Brewster in the 19th century occupied themselves with the secret of the light passing through a pinhole opening out to a dark medium. The first photographic images which Sir David Brewster obtained in 1850's by using the dark room /box technique were improved in the following years. This kind of camera is called a camera obscura, which is Latin for "dark chamber." The first camera obscuras were small rooms that were completely dark except for a tiny hole in a wall that let in a dot of sunlight. People in the room saw an image of the trees and sky on the wall opposite the hole-and were amazed when the image disappeared at sunset! Today darkroom/ box or pinhole pictures are taken by means of the same technique as the one used at the end of the 19th century except for the material used as film and photographic paper.Pinhole cameras can only be loaded and unloaded in a darkroom. 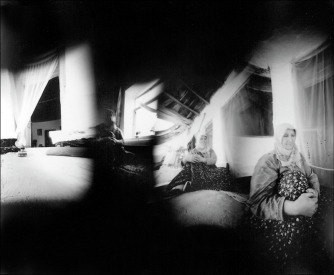 Tuba Koymen, photographer and adjunct professor at TCU University, works primarily with pinhole cameras. Her work is include in Ro2 Art's "Floral to Fantastic: 5 Photographers," currently showing at Ro2 Art's space at 1514 Commerce Street in the DP&L Building in Downtown Dallas, Texas, on view through July 3, 2010. For more information, contact Jordan Roth at 214-803-9575, or visit the gallery's website at www.Ro2Art.com.